Oppo K1 Moniker Officially Confirmed Before Launch - Playfuldroid! 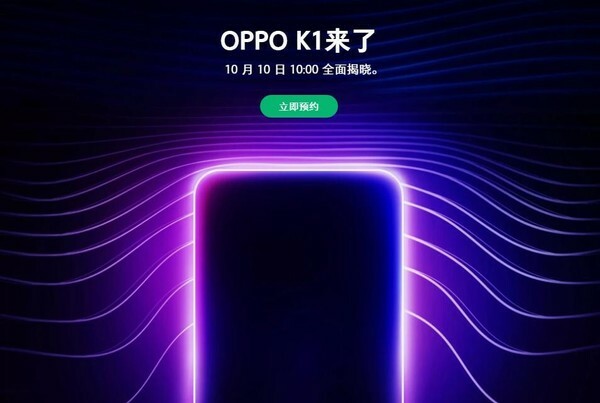 Recent reports have revealed that Oppo will be announcing all new K series of smartphones through its launch event on Oct. 10. Today, the Chinese manufacturer has officially confirmed that it will be debuting the Oppo K1 smartphone tomorrow. Even though the company has not released any information on the smartphone, its specifications have already leaked through its TENAA listing. According to TENAA listing of the phone, the handset is expected to sport a color gradient rear. It is fitted with a 6.4-inch display that supports Full HD+ resolution 2340 x 1080 pixels. It is expected to arrive with an in-screen fingerprint scanner. The handset was recently spotted on Geekbench with Snapdragon 660 chipset. The Oppo K1 is expected to arrive in variants such as 64 GB storage + 4 GB RAM and 128 GB storage + 6 GB RAM. It features a front-facing camera of 25-megapixel. On its rear is 16-megapixel + 2-megapixel dual camera setup. The handset is packed with 3,500mAh battery. It sports a slim profile of 7.4mm and it weighs 156 grams. Rumors have it that the Oppo K1 will be priced around 1999 Yuan.